Announcing the new blog for the Art Libraries Society of North America, NY Chapter (ARLIS/NY): http://www.arlisny.org - see also their Flickr photos. To give our blog a personal touch, we are asking for your help in sending our way art-related, newsy information about yourself. 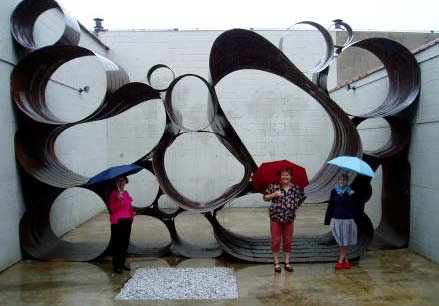 Our membership is made up of creative, fascinating, cultured and knowledgeable people. Let's find out what we are all doing and share our news. art-related awards you've received, milestones, professional activities, presentations, articles you've written, announcements, staffing changes etc. Thanks for your help in making the blog something we can all call our own. Juan de Tovar (1543-1623) was born in Mexico from conquistador stock. He trained as a Jesuit priest and was known as the Mexican Cicero because of his eloquent preaching style and mastery of several indigenous languages. 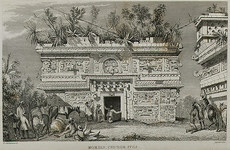 At the request of the Spanish Court, Tovar set about preparing a pre-conquest ethnographic history of the Aztec peoples. He travelled widely, interviewing native Indians, from whom he also commissioned traditional pictographic sketches. 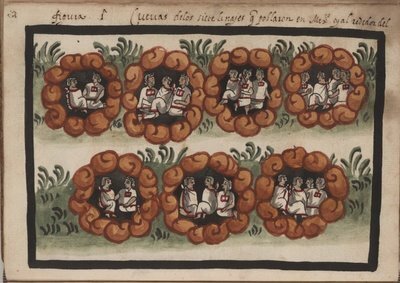 The Tovar manuscript (also known as the Ramírez Codex1) consists of three main sections: an historical account of "the ancient Mexicans from their first migration into the central valley of Mexico, to their conquest by the Spaniards"; an illustrated history of the Aztecs (most images above); and the Tovar Calendar - an attempt to combine the Nahuatl calendar with christian Saint days. The manuscript dates to about 1585. 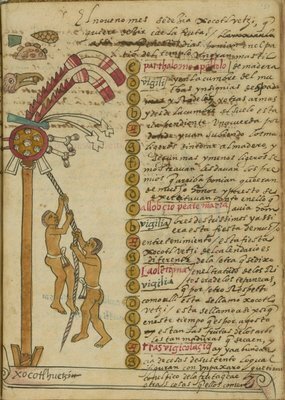 The Tovar manuscript, bearing the title: 'Historia de la benida de los yndios apoblar a Mexico de las partes remotas de Occidente los sucessos y perigrinaçiones del camino su gouierno, ydolos y templos dellos, ritos y cirimonias ... calandarios delos tiempos' is online among the Archive of Early American Images at the John Carter Brown Library at Brown University, Rhode Island. 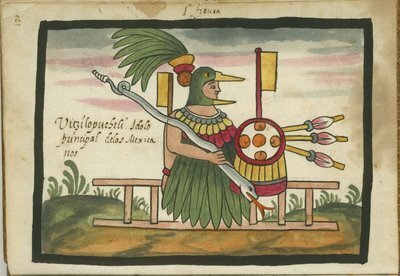 This is an absolutely outstanding collection, with more than 4000 images of 'books, maps, and manuscripts relating to the colonial period of the Americas, North and South, from 1492 to ca. 1825'. I am amazed I had never, to my recall, seen this InsightBrowser site before. I've only had a very modest perusal of their holdings so far, but I will definitely return in the near future. It's great to see any material relating to the Caribbean and the Guyanas, but there is so much more in here. The extent of the background notes is commendable too. These few links give some measure of background, but I didn't find too much that seemed like a confident authority on all of this. 1. Brown University owns the original of the Tovar manuscript and it seems like it is the only complete version in existence. Brown U refer to a single section of their manuscript as being the Ramírez Codex. 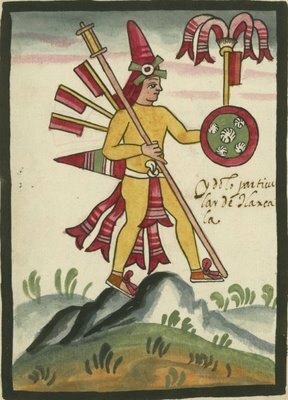 But the Ramírez Codex is housed in Mexico and I assume it is the only other extant copy of the pictographic section of the Tovar manuscript, hence the names get interchanged. There is a LOT more complexity in the background to all this - a mysterious 'Chronicle X' which is said to have been an older source document for both Tovar and at least one other contemporary historian; plus, there was a significant amount of censorship and also uncredited borrowing -- how much of this either is true or has bearing on Tovar's manuscript is beyond the scope of my brief review. Below are a few images -- for more images + excerpts, go to the original post. ON a Sunday night last month at Daddy’s, a bar in Williamsburg, Brooklyn, more than a dozen people in their 20s and 30s gathered at a professional soiree, drinking frozen margaritas and nibbling store-bought cookies. With their thrift-store inspired clothes and abundant tattoos, they looked as if they could be filmmakers, Web designers, coffee shop purveyors or artists. “Maria Falgoust, 31, is also a founder of Desk Set, which took its name from the 1957 Katharine Hepburn-Spencer Tracy romantic comedy. A student who works part time at the library at Saint Ann’s School, she was inspired to become a librarian by a friend, a public librarian who works with teenagers and goes to rock shows regularly. When talk turned to a dance party the group had recently given at a nearby restaurant, their profession became clearer. “Did you try the special drinks?” Sarah Gentile, 29, asked Jennifer Yao, 31, referring to the colorfully named cocktails. That would be the Dewey Decimal System. The groups’ members were librarians. Or, in some cases, guybrarians. “He hates being called that,” said Sarah Murphy, one of the evening’s organizers and a founder of the Desk Set, a social group for librarians and library students. Ms. Murphy was speaking of Jeff Buckley, a reference librarian at a law firm, who had a tattoo of the logo from the Federal Depository Library Program peeking out of his black T-shirt sleeve. Librarians? Aren’t they supposed to be bespectacled women with a love of classic books and a perpetual annoyance with talkative patrons — the ultimate humorless shushers? When the cult film “Party Girl” appeared in 1995, with Parker Posey as a night life impresario who finds happiness in the stacks, the idea that a librarian could be cool was a joke. Now, there is a public librarian who writes dispatches for McSweeney’s Internet Tendency, a favored magazine of the young literati. “Unshelved,” a comic about librarians — yes, there is a comic about librarians — features a hipster librarian character. And, in real life, there are an increasing number of librarians who are notable not just for their pink-streaked hair but also for their passion for pop culture, activism and technology. “We’re not the typical librarians anymore,” said Rick Block, an adjunct professor at the Long Island University Palmer School and at the Pratt Institute School of Information and Library Science, both graduate schools for librarians, in New York City. “When I was in library school in the early ’80s, the students weren’t as interesting,” Mr. Block said. Since then, however, library organizations have been trying to recruit a more diverse group of students and to mentor younger members of the profession. “I think we’re getting more progressive and hipper,” said Carrie Ansell, a 28-year-old law librarian in Washington. In the last few years, articles have decried the graying of the profession, noting a large percentage of librarians that would soon be retiring and a seemingly insurmountable demand for replacements. But worries about a mass exodus appear to have been unfounded. 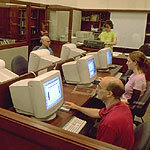 Michele Besant, the librarian at the School of Library and Information Studies at the University of Wisconsin-Madison, said the Association of Library and Information Science statistics show a steady increase in library information science enrollments over the last 10 years. Further, at hers and other schools there is a trend for students to be entering masters programs at a younger age. The myth prevails that librarians are becoming obsolete. “There’s Google, no one needs us,” Ms. Gentile said, mockingly, over a drink at Daddy’s. Still, these are high-tech times. Why are people getting into this profession when libraries seem as retro as the granny glasses so many of the members of the Desk Set wear? 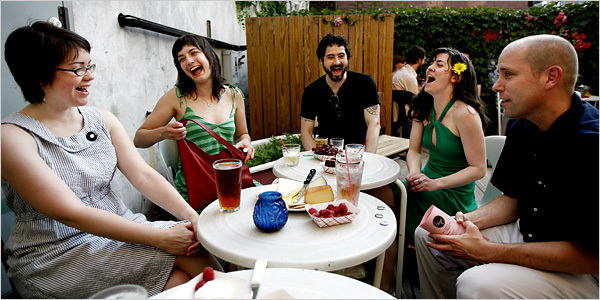 “Because it’s cool,” said Ms. Gentile, who works at the Brooklyn Museum. More a summary of activities and call-to-arms than a ground-breaking analysis of the latest innovations in social networking applications in the museum. On the Sky City Cultural Center, opened in May 2006. "Museums have recognized that their online collections are not doing the job — we're hiding the content away from nonspecialists," said Jennifer Trant, a partner at Archives and Museum Informatics in Toronto. "We've got to provide access on the same level as visual memory." Now, after spending millions of dollars and years of effort on their virtual homes — which draw many more visitors than their physical ones — museums are rethinking their online collections. They are experimenting with one of the hottest Web 2.0 trends: tagging, the basis for popular sites like Flickr.com. In social tagging, users of a service provide the tags, or labels, that describe the content (of photos, Web links, art), thus creating a user-generated taxonomy, or folksonomy, as it's called. 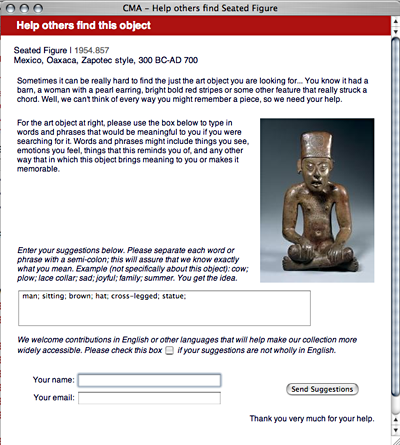 Museums plan to encourage the public to annotate their collections by supplying descriptive tags that could exist alongside professional documentation, creating a new shared vocabulary. Van Gogh's "Starry Night," for example, could elicit tags like "stars," "planets," "swirls" or "insanity." The Cleveland Museum of Art, the Smithsonian Institution and the Powerhouse Museum in Sydney, Australia, already have prototype tagging applications on their Web sites, and nearly a dozen other museums plan similar projects. But can the public be trusted to tag art? Will curators let them? The Metropolitan Museum of Art ran a test in fall 2005 in which volunteers supplied keywords for 30 images of paintings, sculpture and other artwork. The tags were compared with the museum's curatorial catalog, and more than 80 percent of the terms were not in the museum's documentation. Joachim Friess's ornate sculpture "Diana and the Stag," for example, was tagged with the expected "antler," "archery" and "huntress." But it was also tagged "precious" and "luxury." "The results were staggering," said Susan Chun, general manager for collections information planning at the Met. "There's a huge semantic gap between museums and the public." Based on this and other research, a group of museums formed the steve.museum tagging project, which recently received a two-year grant from the Institute of Museum and Library Services. The grant work, which began last fall, is based at the Met and the Indianapolis Museum of Art, and includes the Cleveland Museum of Art, the Denver Art Museum, the Guggenheim Museum, the Minneapolis Institute of Arts, the Rubin Museum of Art in Manhattan and the San Francisco Museum of Modern Art. People may tag selected art from these museums on the project Web site; some of the museums plan applications on their own sites as well. Digital cameras and cell phones are playing havoc with the "Photos Not Allowed" policy at museums, according to a recent article by Ruth Graham in the New York Sun. Museums typically fret that if their visitors take snapshots of artworks on the walls, important "intellectual property rights" are being violated -- though cynics have long suspected that the museums just want to protect their monopoly on postcards and reproductions. These days, images of any popular art project can usually be found on photo-sharing sites like Flickr. Now, pushing things one step further, comes the iMoMA Project by Travis and Brady Hammond, which aggregates all the Flickr images taken at the Museum of Modern Art in New York. The project has special pages for celebrated MoMA works like Claude Monet’s Water Lilies, Barnett Newman's Broken Obelisk and Andy Warhol's Soup Cans, as well as the Yoshio Taniguchi-designed stairwell. Featuring snaps from all angles and under a variety lighting conditions, the project is a veritable phenomenology of the works. Hammond told the Sun that he hopes MoMA will embrace the idea, and feature their project in the museum itself, perhaps as "a little kiosk." How about putting it on www.moma.org? 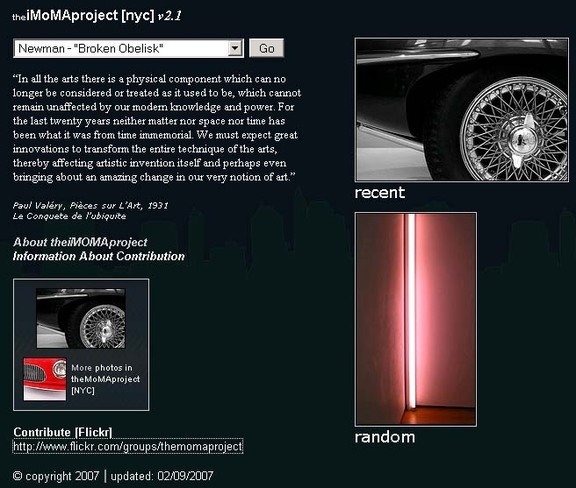 The project would provide a head-spinning mise en abyme on the web! On the left coast, the Los Angeles County Museum of Art has been aggressively enforcing its "No Photos" policy in its current "René Magritte and Contemporary Art" blockbuster. According to BoingBoing, a tech blog, LACMA guards are being forced to leap into action whenever a museum visitor takes a cell phone from his or her pocket. (The guards are also required to wear Magrittean bowler hats!) BoingBoing particularly savored the irony of a show that blocks ordinary people from participating in the very proliferation of Magrittean imagery that the show itself celebrates. As with other attempts to stop the sharing of digital content, any attempt to curtail the circulation of digital images is a fool's errand. As of this posting, dozens of photos of the "Magritte and Contemporary Art" have been posted on Flickr, including numerous snaps of artworks. The content on goldwaterlibrary.org constantly changes -- blogs added to the blogroll, the sidebars rearranged, new features added -- often and usually without comment. Only the most compulsive among its readers will notice the change from one visit to another. Here is a blog about contemporary art on and off the continent of Africa. To push forward the concept of African cultural development I have created this blog but more importantly than that it's a place where we can blow-off steam and discuss the impossible task of defining a continent. Judging from its archives the UK-based blog has been available since May 2006. Contemporary art from African artists worldwide. The majority of the artists are from West Africa especially from French speaking countries or francophone West Africa. Artist profiles and photographs, examples of work, reviews and commentary, tribute to Alexander Skunder Boghossian. Discussion forum. For those Africanists unfamiliar with the SUL site, I strongly recommend a browse through. It includes a search engine that crosses all of its Africa pages (alas, not the 'art' page alone). The Council for Museum Anthropology (CMA) of the American Anthropological Association has recently announced the establishment of an interactive weblog to support the work of the journal of the same name and the field. Found online at http://museumanthropology.blogspot.com, the Museum Anthropology blog will be updated with news of, and from, the field. Among its functions, the blog will fill the role formerly performed by the journal's Exhibitions Listings section. 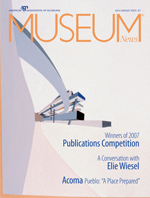 As museums provide the editorial office with press released and other information regarding new exhibitions, these materials will, when appropriate, be posted to the blog. The blow will also provide a space with which news related to the journal may be easily conveyed to the CMA membership as well as the general readership. As with other new media, this blog will surely change as technology and user practices shift. To begin with, the comments function will be enabled and we will experiment with strategies to promote professional dialogue on the subjects featured on the site. The Museum Anthropology blog appears on the Goldwater Library blog in the Blogroll to the left of this post, under the heading MUSEUMS & CULTURE. As the blog you're reading has grown in coverage and complexity these last fifteen months, two threads have emerged: the one centering on the art and material culture represented by AAOA and the Goldwater Library; the other, issues surrounding museum library practices, including using socially networked software (such as blogs, wikis, &c.). As the museum continues to grapple internally with issues surrounding the role of blogs in overall web content generation, it seems counter-intuitive for these issues to be treated solely within the blog itself and for what is under current policy a restricted audience. It's a discussion that would benefit greatly by being opened to a larger librarian and researcher audience. What's more, it might draw attention to the Goldwater Library blog as well as generate suggestions for refinements and improvements. After prodding from my blog colleagues I inaugurated the library of primitive art blog to capture the 'meta'-discussion which the Goldwater Library blog has engendered. The primary authors of the Goldwater Library blog, namely Joy and Erika, have graciously agreed to participate in the LOPA blog as well. I invite everyone to take a look for him- or herself. Please make allowances for its newness and the inexperience of its creator. And feel free to post comments or contact me directly with your thoughts. The Annoyed Librarian offers up a characteristically acid (and sadly on-target) survey of the library blogosphere. I'm too nearsighted to recognize this blog among her examples. Could it suggest that we might just be carving out an entirely new niche? We can only hope so.